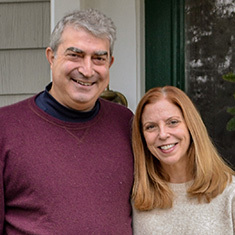 Jan. 25, 2019 — Josh and Jennifer Davis are longtime advocates of the liberal arts. The Wellesley, Massachusetts, couple both attended small liberal arts colleges – Josh is a Swarthmore alum while Jennifer graduated from Williams. All four of their kids (Jennifer and Josh married 10 years ago, each bringing two children to the marriage) followed in their liberal arts footsteps, including Grinnellians Katherine Tucker ’16 and Andrew Tucker ’21. The couple believes in supporting institutions through ongoing donations, even after their children have moved on to the next stages in life. Katherine Tucker works as an admission counselor at Grinnell, and she too has made gifts to Grinnell. At Grinnell, the couple has earmarked their contributions to the Pioneer Fund; Student Health Services; the Center for Careers, Life, and Service; and the Institute for Global Engagement (IGE). “My parents are both psychiatrists and my dad was chief of the psychiatric department at Harvard’s student health services, so I grew up hearing about the ways in which college students grapple with various mental health issues,” says Jennifer, explaining why student health was one area of support. They designated IGE after Andrew had such a great experience his first year at Grinnell traveling to Denmark, Cuba, and Costa Rica to study global health as part of Grinnell’s Global Learning Program Tutorial. “It was an incredible bonding experience and amazing that he had that experience instead of learning entirely in the classroom,” says Jennifer. The two also hope that by being engaged with institutions they care about – both serve on Swarthmore’s Parent Council, for example – their kids will understand the importance of contributing. They also give because those who came before them gave. Resources for Grinnell current and prospective parents can be found on the family information page.